This review proves that Bitcoin Cash Grab is a crypto scam that can only lose your money. Bitcoin Cash Grab is supposed to be an automated trading solution for Bitcoin that can make you thousands of dollars per day. And here comes the miracle, Bitcoin Cash Grab is free, so you are supposed to believe that you can become rich for free. You already now it, nobody will make you rich for free. Nobody will bother begging you to let them make you money. Bitcoin Cash Grab is a scam that is designed to grab your money and steal it from you. In the Bitcoin Cash Grab System video you will see people claiming that they are making money thanks to this program. But they lie. These people are paid actors who have never traded with this system, they are selling fake testimonials for five bucks. Check our picture to see a proof. On the Bitcoin Cash Grab website you will also see some alleged awards that this trading system has supposedly won. But they are totally fake, magazines like BitCoin Sensation Magazine don’t even exist! Bitcoin Cash Grab also shows an article that allegedly appeared in Bloomberg, but it is fake too. Bloomberg nor Business Insider have never published anything about this system. It has never appeared in any media, for that matter, because it is a scam. Now let us explain how Bitcoin Cash Grab will separate you from your money. Right after registering you will be told that the only way to activate the software is to deposit at least $250 with a scam broker called Stox Market. This is because people who run this scam are getting paid by this broker for referring new depositors. This is how it all works and how they will take your money and enrich themselves. Bitcoin Cash Grab is a scam that abuses Bitcoin to steal money from you. Stay away from it! 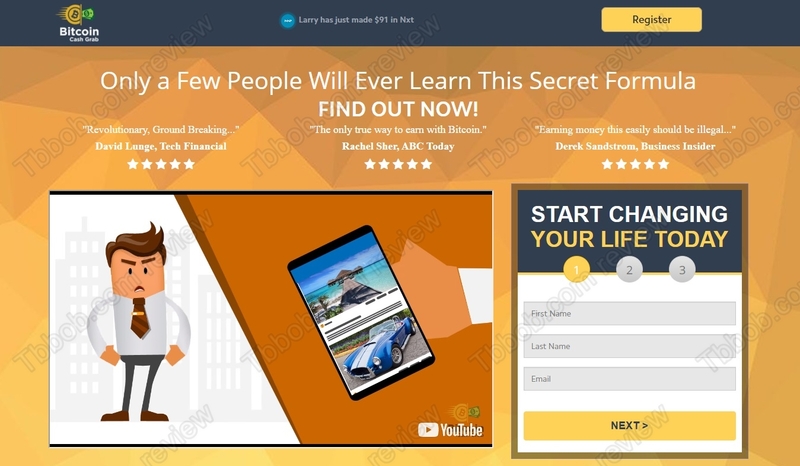 It’s true that you can make money in crypto trading, but you have to learn and build yourself a solid strategy, nobody will do that for you for free. You can try it on a free demo with a regulated broker. And don’t expect millions within a month.